Kale is a leafy green vegetable and is a member of the Brassica family which includes cabbage, collards and Brussels sprouts. Kale comes in a curly variety, an ornamental variety and a dinosaur variety. These three differ in appearance, taste and texture. Curly kale has ruffled leaves and a fibrous stalk and is usually deep green in colour. It has a pungent flavour with delicious bitter peppery overtones. Ornamental kale is a recently cultivated species that is oftentimes referred to as savoy salad. Its leaves can be green, white or purple and its stalks join together to form a loosely knit head. Ornamental kale has a mellow flavour and tender texture. Dinosaur kale is the common name for the kale variety known as Lacinato. It features dark blue-green leaves that have an embossed texture. It has a slightly sweeter and more delicate taste than curly kale. 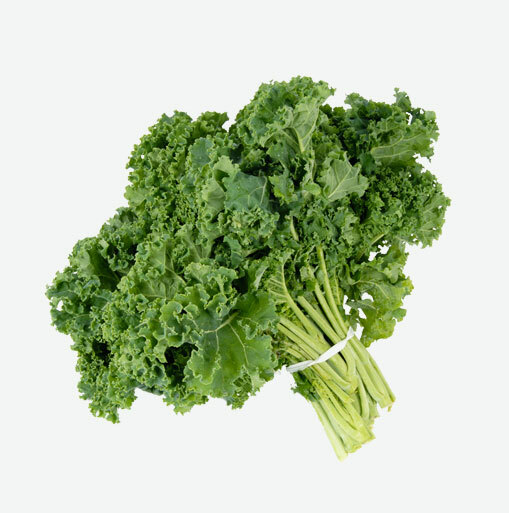 Kale is an excellent source of vitamin A because it is high in beta-carotene. When the beta-carotene enters the body, it is converted into vitamin A. Once inside the body, beta-carotene can be converted into vitamin A. Both vitamin A and beta-carotene are important nutrients for healthy vision. Kale is also a good source of manganese which is a trace mineral that helps to maintain a healthy nervous system. Kale is also a very good source of calcium which is needed to maintain healthy bones. Choose kale that has firm, deeply coloured leaves and moist hardy stems. Kale should be kept cool because warm temperatures will cause it to wilt and will take away from its delicious flavour. The leaves should be fresh, unwilted, and free from signs of browning, yellowing and small holes. Choose kale with smaller-sized leaves since these will be tenderer and they will have a milder flavour than those with larger leaves. Keep kale wrapped in damp paper towels, placed in a plastic bag and stored in the refrigerator. Wash your kale just before using. It can be kept in the refrigerator for up to three days. Wash kale well before cooking or eating it. Both stem and leaves can eaten. If your recipe calls for the leaves only, they can be easily removed. Just take each leaf in hand, fold it in half lengthwise, hold the folded leaves near the base where they meet the stalk, and with the other hand, gently pull on the stem. You can also use a knife to separate the leaves from the stems. Simply sauté kale with fresh garlic and sprinkle with lemon juice and some extra virgin olive oil before serving. Braise chopped kale with apples and add some apple cider vinegar and maple syrup.